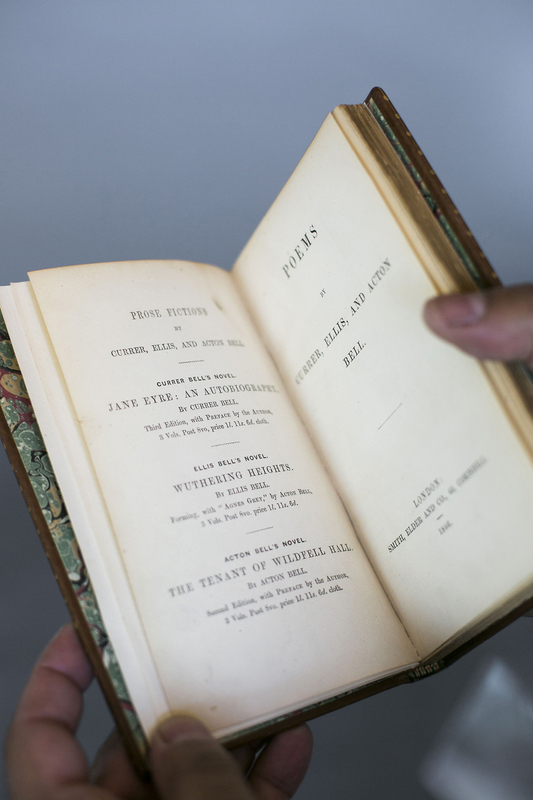 A rare copy of “Poems" (1848) by the Bronte Sisters writing as "Currer, Ellis, and Acton Bell," part of the Stuart Rose collection at the newly named Stuart A. Rose Manuscript, Archives, and Rare Book Library at Emory University. • Collections of mid-to-late 20th century Irish poets' papers are considered the strongest outside of Ireland. • African American history and culture emerged as a focus in 1997, growing into a nationally recognized collection with extensive materials related to African Americans in literature, film, sports and art. • Southern history and University Archives were Emory's first collecting focus, including an ever-broadening array of materials documenting social and cultural history ranging from the Civil War through Civil Rights and beyond. • A page from "The Homilies" of St. John Chrysostom, Archbishop of Constantinople, 400 CE, is the oldest manuscript item. • Miniature books less than three inches long are the smallest items. • John James Audubon's "The Birds of America," measuring more than three feet long, is the largest item. • The Raymond Danowski Poetry Library represents the largest book collection, with 75,000 volumes of English-language literature and growing. 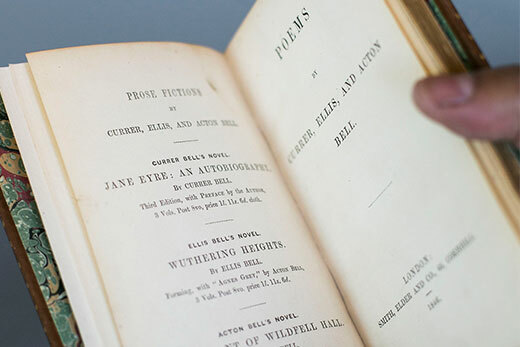 • Rare first editions include Walt Whitman's "Leaves of Grass," Emily Bronte's "Wuthering Heights," Frank Baum's "The Wonderful Wizard of Oz," and a signed copy of Phillis Wheatley's Poems (1773). Emory University's Manuscript, Archives, and Rare Book Library (MARBL) has been named in honor of university alumnus and literary benefactor Stuart A. Rose of Dayton, Ohio. Rose, a 1976 graduate of Emory's Goizueta Business School, is being recognized for his ongoing support and recent significant gift to MARBL, which will become the Stuart A. Rose Manuscript, Archives, and Rare Book Library, or the Rose Library. "Stuart Rose has been a generous supporter, a dedicated alumnus and a guiding spirit. His commitment has helped us achieve international renown for the breadth and depth of our collections," says Rosemary M. Magee, director of MARBL, now the Rose Library. "We are delighted to celebrate all he has bestowed upon us through the naming of the Rose Library." Rose himself is a rare book collector of international acclaim with a distinguished and extensive private library that spans centuries of the arts, literature and the sciences. "Stuart Rose was educated at Emory and developed as a student a profound love of literature," says Kevin Young, award-winning poet and faculty member, and curator of the Rose Library's literary collections and of its Raymond Danowski Poetry Library. "His support recognizes the central role that engaging with these materials has in a liberal arts education." "Special collections are what distinguish today's great libraries, and Stuart Rose is a collector who understands this and has spent much of his life providing ways to preserve and share rare materials," says Emory University Librarian Yolanda Cooper. "I can't imagine a better time or person for Emory Libraries to recognize in this way." Rose has long recognized the link between rare books and research, teaching and learning. "No great university can be without a great rare books library," he says. "It preserves history; it's what scholars all over the world are drawn to study. Over the last 20 years, Emory has done more than any other place I know of to develop and enhance its rare book library. I'm very honored to be associated with the people and the collections there." Rose's gift comes as MARBL opened this fall an expanded and renovated space on the top floor of Emory's flagship library, the Robert W. Woodruff Library. Over time, Rose has made significant contributions to the library's literary collections, including in 2011 a collection of rare editions of works by authors ranging from Emily Bronte and Charles Dickens, to a 1653 first edition of Izaak Walton's "The Compleat Angler" held by fewer than 20 libraries in the United States. In 2013, a gift from Rose made possible Emory's purchase of a collection of rare manuscripts by some of the world's great poets, from an unpublished poem by John Clare to drafts of works by Sylvia Path, Ted Hughes, Samuel Beckett, W. B. Yeats, Seamus Heaney and Derek Mahon. Just this summer he provided additional support for materials in these and other areas. A well-known leader in the Dayton business community, Rose is the former chief executive officer of REX American Resources Corp., a Dayton-based alternative energy investment company. He currently serves as executive chairman of REX's Board of Directors. He is a member of the Folger Shakespeare Library's Board of Governors, and earlier this year the Stuart and Mimi Rose Music Center at The Heights in Dayton was named in honor of support from the Rose Family Foundation. Spanning more than 800 years of human history, the holdings of Emory's Rose Library include major contemporary, historic and international collections that have shaped the human experience. The Rose Library dedication will take place Thursday, Oct. 1, with a ceremony on campus, followed later in the day by a reception and reading by former U.S. Poet Laureate Charles Wright, part of the 10th anniversary celebration of the Danowski Poetry Library Reading Series. That event, open to the public free of charge, is scheduled for 7:30 p.m. in Emory's Schwartz Center for Performing Arts.